Ignited by the successful "Jasmine Revolution" in Tunisia and then fueled by the successful ouster of Mubarak in Egypt, the bonfires of liberty are spreading and bringing light to every corner of the Arab world. After long suffering, the people of the region know that their time has come, and they are choosing freedom. Even Iran and Libya are seeing a reignition of protests after past suppression. 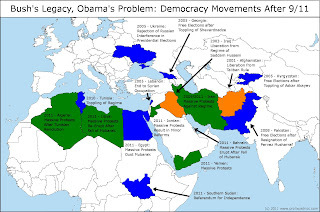 The policy choices for the Obama Administration will be difficult in the short term, but overall, these democratic revolutions are in the best interests of American foreign policy. By supporting the fight for freedom everywhere, we can regain our reputation as a force for good in the world and also remind ourselves of what is at stake on our own shores. 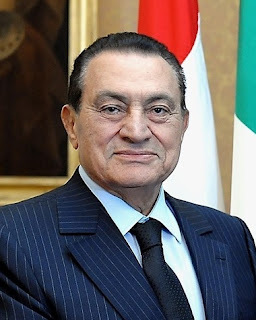 Bloody clashes in Cairo yesterday and today suggest that President Hosni Mubarak is gambling that he can convince his people and his erstwhile Western allies that his regime is the only thing standing between relative calm and stability and the catastrophe of a full-blown Islamic revolution similar to Iran under the Ayatollah or Afghanistan under the Taliban. However, this is a false choice both for Egypt, and for Muslim nations around the world. After September 11, America embarked on a war against the Taliban which under the so-called "Bush Doctrine" expanded into a commitment of the United States to fight Islamic extremism anywhere it is found. Opponents of this strategy argue that America should not and cannot force Western values on Muslim nations and they are correct, but only just. Liberals in America have either forgotten or rejected the notion that religion can coexist and thrive with a secular democratic government. In truth, there are not two choices for Egypt and for the Muslim world, but three. 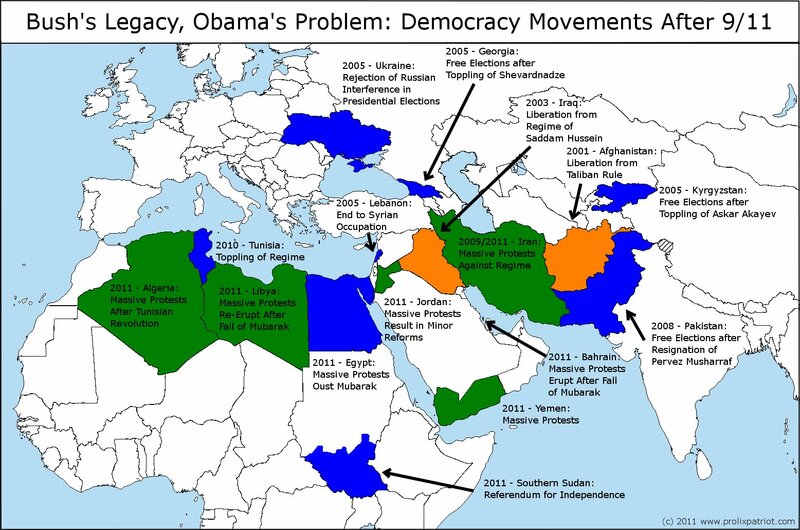 Rather than making the false choice between theocratic and secular forms of totalitarianism, the Egyptian people can learn from the example of new democracies in Indonesia, Afghanistan, and Iraq, where the rule of law and basic human rights are upheld in parallel with a religious understanding of morality. In fact, until recently, this was the basis of democracy right here in America. The global war on terror is more than just a fight between the West and Islamic extremism. There is another front of this war which is being waged here at home. We are not only fighting for freedom in the face of theocratic tyrants who would return the world to a mediaeval understanding of Islamic law, but we are also fighting for the core principles of classical liberal governance here at home in the face of an overwhelming and unprecedented expansion of government power. Whether in the debates over TSA’s enhanced screening procedures or the ill-conceived "kill switch" that is again being considered in the back halls of the Capitol, the technocratic forces of modern liberalism (or progressivism if you prefer) are just as much of a threat to our freedoms as the fanatical hijackers and bombers who would slaughter the innocent. If basic rights are not protected by the force of law, it does not matter whether the government is secular or religious. Freedom is a powerful thing, but it also demands that we have the dedication to our principles to allow people to make the wrong choices. Rather than attempting to control peoples’ lives through the endless bureaucracy of Bloomberg’s nanny state in New York or the death squads of the Islamic morality police in Iran and Saudi Arabia, the fundamental principle of Western liberal democracy is that given a healthy religious sense of morality, the people will make the right choice between good and evil. Instead of the false choice between Hosni Mubarak and Osama bin Ladin, the Egyptian people know that there is a third way where freedom and religion can coexist peacefully. Why do we in the West doubt them? Indeed, on our money and in the pledge to our flag, we have a constant reminder that ours is "One nation, under God." Perhaps we need that reminder now more than ever.